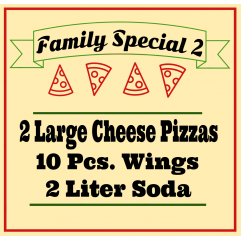 1 Large 1 Topping Pizza, 10 Pcs Wings, 2 Liter Soda. 2 Large Cheese Pizzas, 10 Pcs. Wings, 2 Liter Soda.Toppings are optional.You can't use dis..